The percentage of babies who get an ear infection has dropped in the last 20 years. Doctors believe the decrease is due to the introduction of the pneumococcal conjugate vaccine, flu vaccines, an increase in breastfeeding, and a decrease in smoking. According to a recent study, fewer babies are getting ear infections than they did 20 years ago. In the 80’s and 90’s, about 60 percent of babies had an ear infection by the time they were one year old. Today that number has dropped to 46 percent. Why? Doctors believe it is a combination of vaccines, a drop in smoking, and an increase in breastfeeding. In recent years, the pneumococcal conjugate vaccine has become available. Designed to prevent diseases like meningitis, blood infections, and pneumonia, the vaccine targets several strains of pneumococcal bacteria. These strains also happen to be one of the major causes of ear infections. Flu vaccines have also helped. 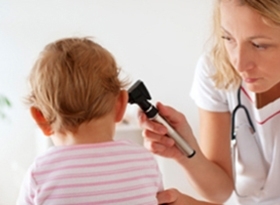 Most ear infections develop as a result of viral infections like influenza (flu). Fewer viral infections mean fewer ear infections. Studies have shown that children who are exposed to secondhand smoke are more likely to develop an ear infection. The good news is that fewer children are being exposed to secondhand smoke as more homes are becoming smoke-free. In 1993, only 45 percent of homes had rules against smoking in the house. By 2006, that percentage had jumped to 86 percent. Breastfeeding your baby for the first six months of life can protect against a range of diseases and infections, including ear infections. Breast milk contains antibodies that help fight off infections. In the study, breastfeed babies were 60 percent less likely to suffer from an ear infection in the first six months. It is exciting to see how much impact parents and their choices can have on the health of their children.